My earlier Tiny Lisp Computer 2 PCB was a board running Lisp that was just 3.25” x 1.5”, but although it had an integrated display, it needed an external keyboard. 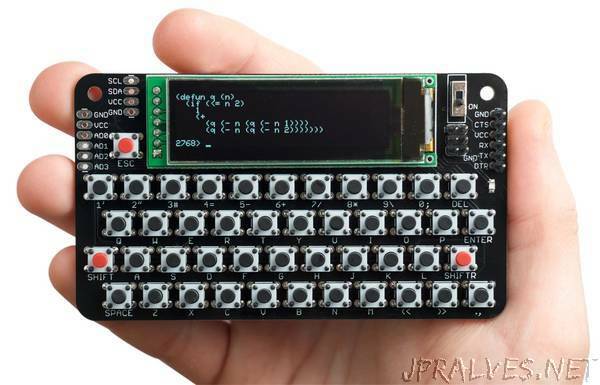 I was inspired to make this new version when I saw Voja Antonic’s Belgrade Badge, a self-contained BASIC computer with an integrated keyboard and display designed for the Hackaday Belgrade conference in July 2018 . The keyboard is based on tactile pushbuttons that are available for under 6 pence/cents each. I decided to keep the board as compact as possible by providing only the keys needed to program in uLisp, which meant departing from a standard keyboard layout. One benefit of this is that the keys you use a lot when entering Lisp programs, the parentheses ‘(‘ and ‘)’, are on two dedicated keys on the bottom row of the keyboard. For the display I chose a very nice greyscale OLED display with a resolution of 256 x 64 available on AliExpress , which gives a text display of 42 x 8 characters. It’s slightly more expensive than the usual 128 x 64 displays, but is perfect for this project.